I recently had the pleasure to sit down with three pioneering individuals in the global telecom and infrastructure space. We discussed a variety of initiatives, primarily envisioned by my long-time friend and industry colleague, Hunter Newby. Hunter Newby is an industry visionary who was key in developing the colocation / data center interconnection world that network and service providers have come to rely on. While that’s the start of Hunter’s story, this conversation is a continuation of it. Along with industry colleagues and CEOs Michael Cunningham of Crosslake Fibre and Gil Santaliz of NJFX, we had the opportunity to explore a new wave of interconnection. This new wave of interconnection moves the capabilities outside of the network core to the ‘continental edge,’ where data centers are the cable landing stations and cables are the new bypass points. 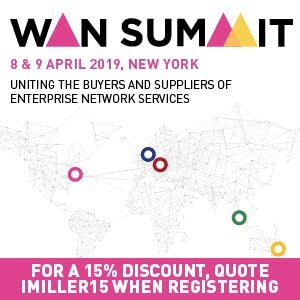 In this discussion you will learn about the new routes and facility developments that are helping to shape the internet and today’s communications infrastructure to be more reliable, faster, efficient and ultimately more effective. Ilissa Miller (IM): Mike, Crosslake recently announced that it would be building a new subsea cable on the East Coast of the US. Can you tell us about this? Crosslake Fibre recently announced our new project called the WALL-LI project. The concept of the subsea cable project is to build a new subsea cable from Wall, New Jersey, up to Long Island. Our two end points are the 1025Connect data center and NJFX Tier 3 colocation campus. The project is designed to replicate Crosslake’s model, which is essentially building niche submarine cable routes and providing dark fiber services over those routes. We differ a little from other subsea projects because we play in the terrestrial space, ultimately offering a new solution that is a subsea-based solution. IM: So, what are you doing differently with the WALL-LI system and why did you choose this specific route between these two facilities, 1025Connect and NJFX? MC: We’re providing a new physically diverse lower latency path between two important end points. For the WALL-LI project, we’re providing a more direct path between many of the transatlantic cables that come into Wall, New Jersey, or cables that come up from Latin America, and connecting that to Long Island where you have transatlantic cables coming in from Europe. Those are really big pipe cables, core assets, and what we’re doing is we’re providing a bridge between those important assets that is physically diverse from other existing routes. It bypasses Manhattan, which is a key point of congestion for many networks. IM: That makes perfect sense, thank you. Transitioning a bit here, we know why 1025Connect and NJFX have been selected; we need accessible on ramps to the system. From Gil, I’m interested to hear how you see this solution helping your customers? Gil Santaliz (GS): We’re happy to have Mike and Crosslake Fibre play a role in making NJFX a truly revolutionary Tier 3 colocation campus in terms of transatlantic capacity. If we take a step back for a moment, NJFX began in 2015 with the original idea to create the ability to access capacity directly to and from a cable landing station. It struck me as odd that we take capacity across the ocean 6,000 miles and then transition over to a pair of fibers, to cross bridges and tunnels in and out of manhole systems, and end up in major metro environments where data centers, as the original hubs, reside. We realized that we should allow the marketplace to be able to let backhaul providers make the investment, and properly give transatlantic cables an on-ramp at the cable landing station, which required a separate building that was truly carrier-neutral. Then along came a new cable called Seabras that came in from Brazil. So then, we were sitting in a building where we had cables to Brazil and two going to the UK and were starting to collect more and more backhaul providers, and a marketplace was born. What Crosslake has done is validated this revolution, while enabling a new way around a congestion point called North Jersey, New York City, where we are not reliant on one or two backhaul providers to ‘hopefully’ do a good job getting us through and connecting. Crosslake provides the direct connection between two critical infrastructures: The Long Island Cable Landing Stations via 1025Connect and the Wall, New Jersey Cable Landing Station with NJFX’s purpose-built Tier 3 colocation campus. IM: Thank you Gil, that certainly makes sense. For you Hunter, how does this new interconnection capability enable customers at 1025Connect? Hunter Newby (HN): I obviously echo everything that Gil just said because 1025Connect functions with the same purpose. 1025Connect is the alpha to the omega of NJFX. Almost 20 years ago, while I was with at Telx in 60 Hudson Street, we saw that all the submarine networks were backhauling all the way into Manhattan. As a way to help facilitate interconnection between their networks, we created a neutral interconnection environment to enable the backhaul connectivity to more efficiently interconnect with other terrestrial fiber networks, and that is how the global subsea interconnection business at Telx was born. Many of the submarine cable systems were already in the building, just on different floors, and they needed to connect to each other, and we became the meet point. They already traversed from the cable landing stations through the backhaul, through the bridges and tunnels, the manholes and the POEs and the risers, to different floors in a building; and now they needed to go from that equipment and connect to each other. And so, the first neutral Meet-Me Room was born as Telx. While creating that facility, on the ninth floor at 60 Hudson, it dawned on me that becoming successful in creating the first neutral meet point where all the north transatlantic systems had a physical presence would also be succeeding in creating the largest single point of failure on the whole eastern seaboard of the US. That really scared me. So, I started to think about mid-span interconnection points to the subsea cables that land on Long Island, and that’s the genesis of 1025Connect, or LIDARC, which stands for Long Island Data and recovery Center, as it was originally known. This highlighted an even more poignant question: Why don’t we connect closer to where the landing stations are? 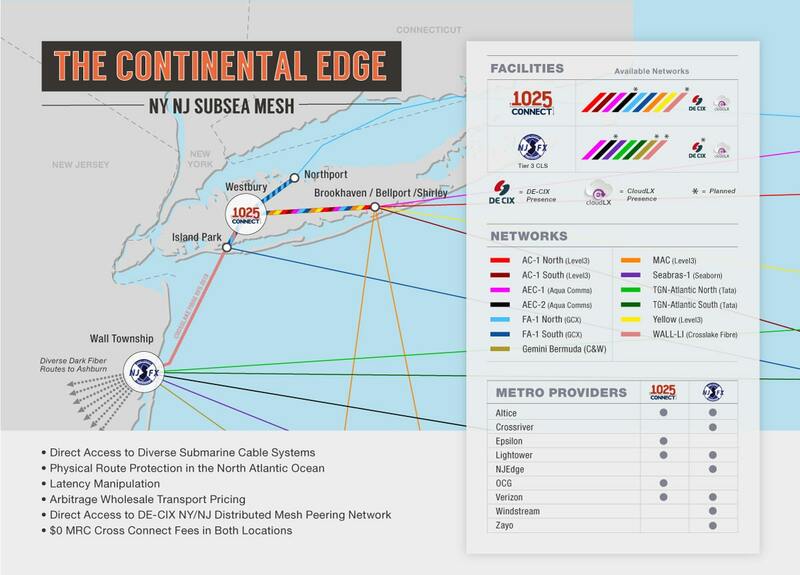 Now, with 1025Connect on Long Island and NJFX in Wall, New Jersey, Crosslake Fibre provides us with the direct interconnection point between subsea cables without the doom and gloom that could be with a single point of failure interconnection hub in the middle of Manhattan. IM: I hear a lot of synergies between 1025Connect and NJFX. Are there any synergies about the way you both do business that could be helpful and more streamlined for customers? GS: This was Hunter’s idea, NJFX. I used to own a fiber network across New Jersey where I was constantly being asked how to get between point A and point B and provide high reliability. And when I sold that company to Cablevision Lightpath in 2008, Hunter and I talked about what’s next, and this was next. We realized that subsea cables need to have a proper on- and off-ramp much closer to where the cables actually physically land. The model NJFX follows today is similar to 1025Connect’s in that we have easy to understand pricing; we are both carrier-neutral, we understand how to bring other providers into the fold fairly and equitably. The philosophy of a carrier-neutral, open environment, helping your customers try and accomplish what they’re trying to accomplish, is what is most important to me. We also do not charge recurring fees for cross-connects; we have an open architecture that everyone is welcome, in fact, the more the merrier. What this really facilitates is a massive ecosystem that allows investment to happen because one of the questions that I’m always asked is, “Why are they going to come to your facility, Gil?” And the answer is, because they’re all going be treated fairly. HN: What Gil is saying is that 1025Connect and NJFX both have a common philosophy predicated on the original idea born at Telx, which is to treat the customers in a predictable fashion, in a carrier-neutral facility and help them grow their businesses. But one thing that wasn’t touched upon is contracts. 1025Connect and NJFX are two different entities. They have two different MSAs, and two different service orders, and two different processes in that regard. It is only two facilities we’re talking about, and thus far we haven’t come across any network operator that’s had an issue with that. Putting that aside, customers know what they’re going to get, and like Gil said, it’s about predictability, reliability, and not fearing that they’re going to have dramatic price uplifts in the near term, or over the term of their agreement which are going to have a dramatic negative effect on their margins. GS: If I could just add here, one of the things that I learned in the last year was, what are the ingredients that make a successful cable landing station? Cable landing stations need reliable power, they need elevation and they need backhaul. The rest is simple. But those three elements are not simple. Electricity works very much like telecommunications works. The closer you are to the core router, the safer your connectivity will be. With electricity, the closer you are to a substation with a direct feed, the more reliable your power’s going to be. These cable landing station operators / cable operators want to have reliable power, unlike what happened in Puerto Rico where they had outages that lasted for days and weeks, as an example. So, the economies of scale to have multiple cables landing in one place makes sense, because it’s very hard to find a location with the elevation, logical infrastructure and that backhaul optionality. IM: Thank you for the discussion. It is very insightful and provides a very logical business perspective. My last question is for Mike. There seems to be resurgence in new subsea cable systems. How do you see Crosslake positioned in the market as compared to other systems that are on the rise? MC: There is resurgence in the industry. After the dotcom boom there was a real hangover in terms of lack of development of new systems, just because there was an overbuild and a lot of speculation and capital that went into the industry at that time. It took us a decade to get through that, and now you’re seeing a lot more systems being developed simply to pick up the slack. New developments that are happening don’t represent excess capacity supply due to the changes in the market with the emergence of bigger bandwidth solutions such as OTTs and technology like Artificial Intelligence and much more. If you take a look at many of the new builds, they have been larger or transoceanic builds, and that’s where we differ. What you haven’t seen especially in North America is many small builds. That’s the niche that Crosslake Fibre is trying to fill. We’ve identified niche routes that play in the space that’s currently served by terrestrial routes. The value proposition is that we can go and construct a route that hasn’t been constructed today, because the alternatives are terrestrial. Because of this, the projects are more capital intensive. This requires us to be confident in the routes we select. There really is a lot of thought that goes into the design and the route. That’s why 1025Connect and NJFX make sense. Their facilities are very long-term assets and are a good fit with us from that perspective, as well as the fact that they’re network connectivity hubs, which will provide access to customers, which are ultimately driving our business. If we were just to land at a cable landing station, our model wouldn’t survive that. We have to get to the customers and the critical mass of customers, so we have to extend our network to get to a facility that can in many ways act as a cable landing station but at the same time provides more connectivity from that point out. IM: Thank you Mike. That’s a great wrap up to this interview. As I hear these three companies discuss a synergistic approach to the market, it is clear that the individuality of each company allows for greater flexibility in terms of the products and services they bring to the market. However, the philosophy behind the driving force for each entity being connectivity and interconnectivity is a common business endeavor that ultimately helps customers. The key component here is diversity, reliability and functionality to enable the burgeoning demands of the new software capabilities such as Artificial Intelligence, Virtual Reality and, of course, Big Data processing. We always talk about the shortest path being ‘as the crow flies,’ or in this case direct connectivity from point A to point B without a central hub serving as a directional interconnection point. To learn more about these three companies, please visit www.1025Connect.com, www.crosslakefibre.com and www.njfx.net, respectively.